Ahh, sweet tea. It might just be the only thing you know about the South. Well, maybe you’ve heard we make great fried chicken, biscuits and gravy, and maybe you’re even smart enough to know what CFS stands for. But sweet tea is the real thing we’re famous for. It’s the house wine of the South. We go through gallons of it year ’round. I grew up with lemon slices in sweet tea, but since Mr. Dessert For Two grew up in Georgia, peach sweet tea is more familiar to him. Since we try to make this Texas/Georgia hybrid relationship work in California, I’m giving you the option for a lemon cream topping or a peach cream topping. Such a delicious compromise. In a small saucepan or microwave, heat 1 cup of the water to a brisk simmer. Turn off the heat, add the tea bags, then cover and steep for 10 minutes. Meanwhile, whisk 1/3 cup of the sugar vigorously into the remaining 1 cup of cool water. (Preventing the sugar from coming in contact with super hot water keeps your tea from having a bitter taste). Once 10 minutes has elapsed, remove the tea bags (squeeze them gently), then pour the mixture over the sugar-water mixture, stirring to combine. Pour the entire thing into a shallow pan (I used an 8x8” square baking dish), and place it in the freezer. 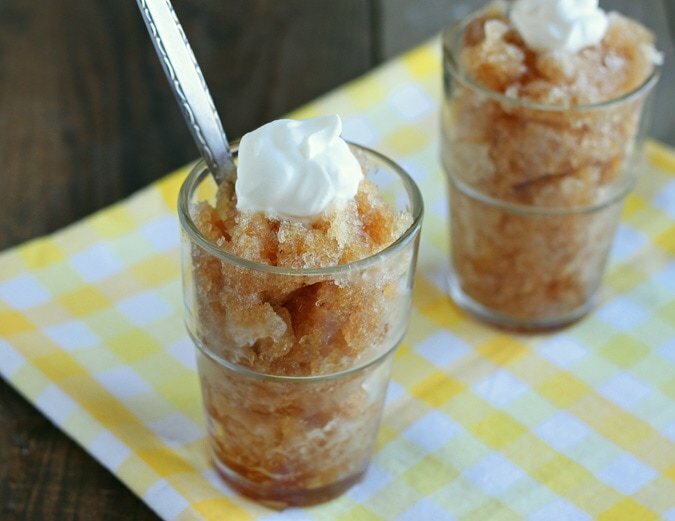 Freeze for 1 hour, then scrape the entire mixture with a fork to break up the ice crystals. Return to the freezer for another hour or two, or until it freezes almost solid. Meanwhile, beat together the heavy cream, the remaining 1/2 teaspoon sugar and lemon zest. If you're making the peach cream, omit the 1/2 teaspon of sugar and beat in the peach syrup. Once soft peaks form, store it in the fridge until ready to serve. 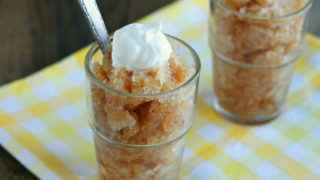 To serve the granita, scrape it again with a fork into serving dishes and top it with the whipped cream. *The peach syrup I'm referring to is the flavored syrup used for making coffee and tea drinks at cafes. I love the Monin brand. If you can't find it, use peach nectar or extract. I love this as a summer treat! Gallons and gallons we go through around this outfit! 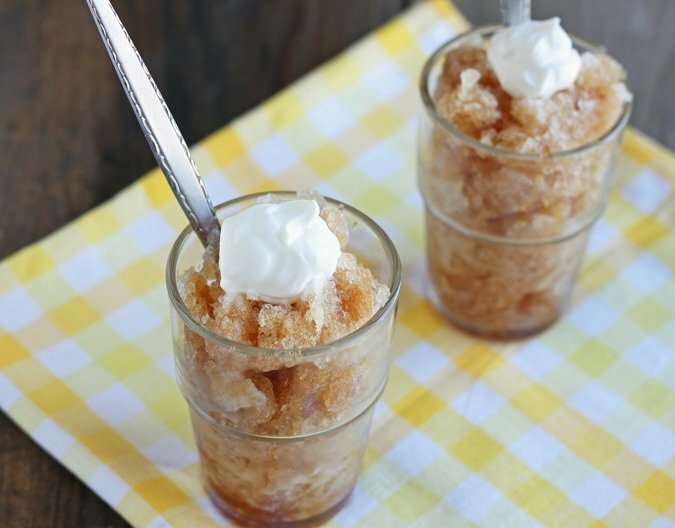 I love the idea of making granita, never tried it with tea! I tend to refer to it as tea, not sweet tea, I don’t think of tea not being sweet! Very foreign to everyone here in Wyoming. I also love your toppings. Wow, does this ever sound refreshing. I might just try making it with some sweet tea in the fridge leftover from this weekend. Sweet Tea, ah yes, in South Texas it is the tea of choice. Every restaurant has the option. If we go somewhere without Sweet Tea, my hubby freaks. This looks so good and with the drought we are going through right now in, it looks like heaven in a glass. What a special summertime treat! a little texas a littel georgia..yummy!! I LOVE this!!! :) You have no idea how excited I am about this recipe! Nice! I am a southerner, but cannot drink tea. However, my husband would LOVE this! Thanks! Ooh this looks so refreshing especially when the temps have been soaring lately. I love granitas. I recently made a Pina Colada and Coffee Granita. They’re so simple and refreshing. Kind of like an adult snow cone. I’m looking forward to trying this. Thanks for your post. Sweet tea is like a little bit of heaven in the summer. OMG-I HAVE to try this! What a great idea!!! wow! I love love this one! This looks very refreshing – and I LOVE ice tea (or sweet tea as you call it in the US). How fun! I admit, I can’t drink sweet tea. Growing up, I drank unsweet tea. But, as a frozen treat? I might have to step out of my comfort zone. Thanks! I absolutely LOVE sweet tea and this adaptation would be perfect for the end-of-summer get togethers! YUM!!! As a fellow Northern Californian transplanted from the South, this sounds amazing. It’s almost impossible to find sweet tea out here, and you just have to make it yourself. I love the idea of the citrus or peach cream on top! Great idea! I’d like to feature this recipe on my blog, linking back to you, naturally. I’m not certain about the Miss Manner’s guidelines regarding this, but I’m pretty certain I should ask, first. Would this work for you? Thanks! I love sweet tea and this certainly amped up the cool factor. No pun intended. Thanks for sharing!